On Sunday 10 April Fitwilliam College will, together with Churchill College, open its gardens to visitors as part of the National Garden Scheme’s ‘Gardens open for charity’ events. Each year the National Gardens Scheme (NGS), founded by the Queen’s Nursing Institute in 1927, organises the opening of outstanding gardens to visitors to raise funds for charities involved in the nursing and caring of people. 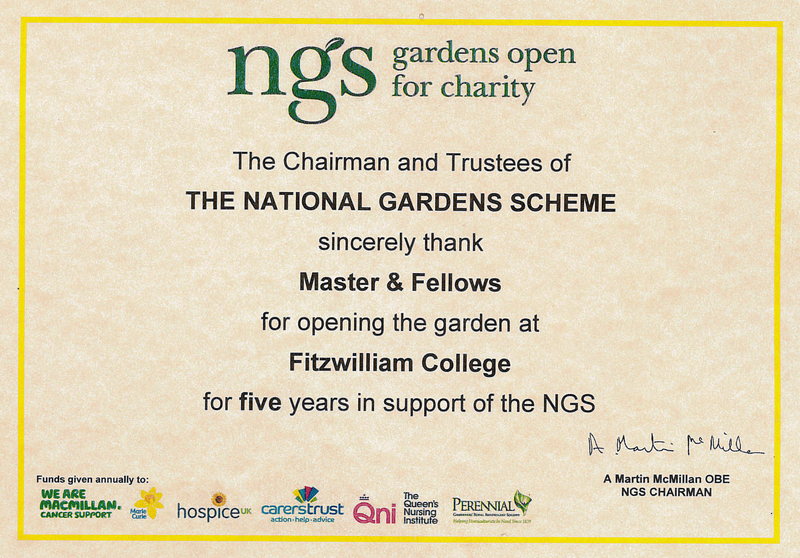 Since its foundation, the NGS has donated over £45 million to Macmillan Cancer Support, Marie Curie, Hospice UK, Carers Trust, The Queen’s Nursing Institute, Perennial and Parkinson’s UK; MS Society and Horatio’s Garden are this year’s guest charities. Those visiting Fitzwilliam on Sunday 10 April will be able to walk around the College grounds and observe the beautiful landscapes created and curated by Head Gardener Steve Kidger and his team which include, among others, a 200-year-old plane tree (Platanus hispanicus), Primula and Dicentra nestled among ferns and ivy-leaved Cyclamen flowers, the Acer ‘Drummondii’ planted by King Juan Carlos and Queen Sofia of Spain, and a Gingko biloba, a primeval species 270 million years old and only living species of the Ginkgophyta. Date and time: Sunday 10 Apr (2pm–5pm). Address: Fitzwilliam College, Storey’s Way, Cambridge CB3 0DG. Directions: 1m NW of Cambridge city centre. Turn into Storey’s Way from Mandingley Road (A1303) or from Huntingdon Road (A1307). Free parking. Admission (combined with Churchill College): £5, children free. On-site facilities: Café for drinks and snacks.